Quite a few plants have developed ways to attract, trap and digest insects and other small prey. Though not related to each other, they share a common problem: how to get nutrients needed for growth when the soil is very acid, like that found in bogs, or very sandy and lean, poor in nitrogen and other nutrients. Becoming carnivorous is their way of surviving in these environments. Many carnivorous plants secrete a sweet solution to attract the insects it needs. Sundews, for instance, have glandular hairs that secrete a sticky substance that both attracts and traps its prey. The hood of a Pitcher Plant has glands that secrete nectar and entice flies and other insects to come inside. The leaves of a Venus Flytrap are modified into two lobes that close over an insect once it touches the hairs on their surface. 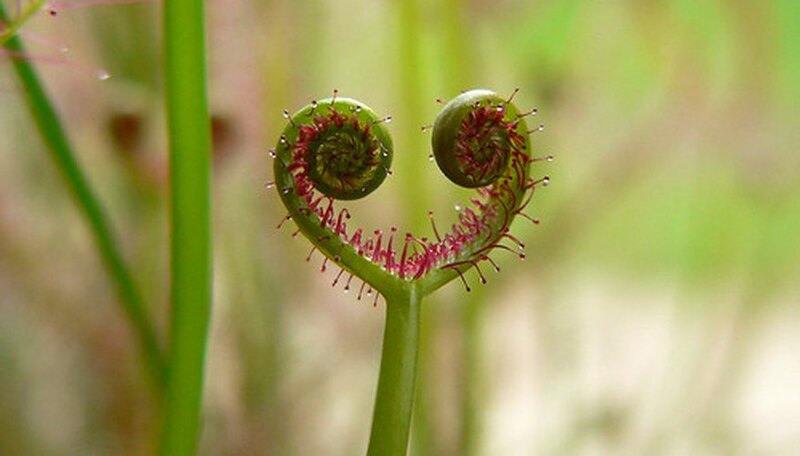 Flypaper-type traps, such as the Sundews and Butterworts, rely on a glue-like mucilage to cover and suffocate the prey. Others, such as the Pitcher Plant, have leaves that are modified into pitfall traps that are filled with enzymes to break down tissues into a form that can be used by the plant. All carnivorous plants secrete enzymes that digest the prey, turning the soft tissue into a nutrient-rich soup that is then absorbed by the plant. These enzymes are on the surface of the tentacles of a Sundew, deep within the pitcher of a Pitcher Plant, and on the surface of the lobes of a Venus Flytrap. Each species has modified its leaves in certain ways to meet the challenges of catch and digesting insects. Venus Flytraps, for instance, has developed chemical reactions that allow its leaf lobes to close quickly, often in under a second, to trap prey. Pitcher plants and others whose digestive enzymes pool at the base of a cup have created hoods to keep rain from diluted these enzymes. Most carnivorous plants have root systems, but they are often small and used mainly for attachment rather than for absorption of nutrients.